As soon as tissues are removed from the body, the vascular supply is lost, haemoglobin leaches from the red blood cells and the tissues begin to die. Consequently, for tissues to be studied in the histology laboratory, they need to be fixed and preserved in a life-like manner. Fixation inhibits autolysis and putrefaction, hardens tissue and allows easy manipulation of soft tissues such as friable tumours and brain. Fixation also converts normal semi-fluid consistency of cells (sol) to an irreversible semi-solid (gel). 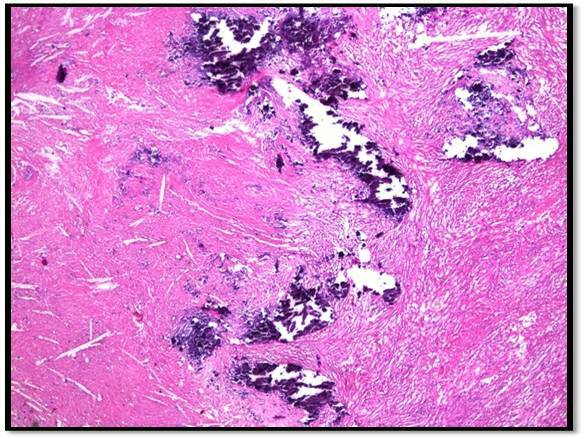 The most widely used fixative in cellular pathology is formalin. When formalin comes into contact with fresh tissue, the haemoglobin becomes converted to the brownish tan pigment haematin. This conversion is observed when fresh tissue (which is normally a red-pink colour) is placed into 10% formalin at room temperature. Over a relatively short period of time, a change in surface colour to grayish brown occurs and this change can be seen in the images below. When this colour change is complete, the tissue is generally considered fixed and ready for conventional histological processing. The commercially available solution is a gas (formaldehyde) which is able to dissolve in water up to 40%; this solution is called formalin. In the fixation of tissues, probably the most important reactions are those which stabilize the proteins. Aldehydes have the property of forming crosslinks between proteins thereby forming a gel, ideally keeping everything in their in vivo relationship to each other. Soluble proteins are fixed to structural proteins and thus rendered insoluble and the whole structure is given some mechanical strength. In the formation of crosslinks with proteins, probably the most information is known about the behaviour of aldehydes. Reactions between formaldehyde and amino acids and proteins have long been known. Essentially, crosslinks are formed between protein molecules, the reaction being with the basic amino acid lysine. The reaction between proteins and formaldehyde is largely reversible by an excess of water over the first 24 hours of reaction time. Formaldehyde is a well-known chemical that has a multitude of uses - from being a component of furniture and carpet glues in specific manufacturing applications to being a disinfectant and preservative in hospital, research and mortuary settings. In cellular pathology, the concentration of formalin most often used is 10% (which is equivalent to 4% formaldehyde). Formaldehyde itself is actually a gas under normal or standard conditions. The formaldehyde with which we are most familiar is a 37-40% solution of formaldehyde gas dissolved in water. Formaldehyde is the simplest member of the organic class of mole­cules known as aldehydes and has a chemical formula of CH20. The aldehyde category is comprised of molecules containing a H-C=O functional group (that is, an atom of carbon both single-bonded to an atom of hydrogen and double-bonded to an atom of oxygen). This functional group needs to be at one end of a molecule in order for the molecule to be consid­ered an aldehyde. In contrast if this group is located somewhere within the body of the molecule, the molecule is then classified as a ketone. If the aldehyde was actually formaldehyde, the "R" would be a hydrogen atom (H). Regarding the "H" group key, what exactly are alkyl and aryl groups? Simply stated, they are aliphatic and aromatic hydrocarbon derivatives, respectively. A hydrocarbon is a molecule that consists of strictly hydrogen and carbon atoms. Aliphatic molecules are those that are in chain form, while aromatic molecules are simply those that form a ring. Formaldehyde has a strong tendency to polymerize in solution. This means that the monomeric subunits (CH2O) join together to form an aggregate of a higher molecule weight but of the same chemical ratio. In solution, formalde­hyde is generally in dimeric and trimeric form (two and three linked monomeric subunits, respectively). However, commercial 10% formalin is generally in monomeric form. Polymerization is significant when it comes to fixation, as a higher molecular weight and overall greater size mean a slower penetration rate (molecular weight and rate of penetration are generally inversely proportional to one another). To this end, manufacturers add methanol to formalin solutions in order to help prevent polymerization. Methanol is a close relative to formaldehyde (albeit the former is an alcohol, not an aldehyde). The difference between the two molecules is that methanol has a hydrogen atom single-bonded to its oxygen, which directly results in a single bond between the carbon and oxygen atoms (C-OH), instead of the double bond that is present between the carbon and oxygen atoms in an aldehyde (H-C=O). This is also why methanol is so toxic to the body. Ingested or absorbed methanol is oxidized within the body to formalde­hyde and formic acid. The latter is the oxidation product of formaldehyde, so the "oxidation chain" goes from methanol to formaldehyde to formic acid. Formaldehyde is a non-coagulating, additive fixative - meaning that while it chemically bonds itself to the tissue, it does not form a gel-like matrix that inhibits subsequent reagent penetration. The portions of the tissue to which formaldehyde binds are primarily the reactive hydrogen atoms found in amino acids. 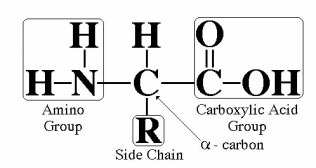 All amino acids consist of an amino group (-NH2) on one side of the molecule and a carboxyl group (-C02H) on the other side of the molecule - so when bonded together in a chain to form a protein, one end of the overall protein will be an amino group (known as the N-terminal end) and the other end of the protein will be a carboxyl group (known as the C-terminal end). A molecule of formaldehyde will usually react with the N-terminal end of proteins - producing methylene (H-C-H) bridges between protein molecules. 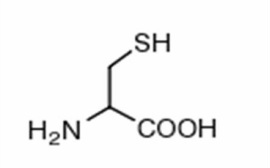 The reaction with the N-terminal end is thought to be due to the usual pH range of formalin solutions and the biochemical proper­ties of amino acids. Formaldehyde also binds with sulphydryl groups (-SH) in the amino acid cysteine to form cross-links that further stabilize the proteins. These bridges and cross links, while stabilizing and preserving the tissue, are what create the need for epitope retrieval steps in various immunohistochemical procedures. A consideration present when using formalin as a fixative is the pH of the solution itself. 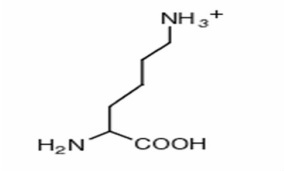 As stated, due to the usual pH range of formalin solutions, formaldehyde molecules will normally bind with the N-terminal end of proteins. This pH is normally somewhere near neutrality. When the pH of a formaldehyde solution (such as 10% formalin) becomes acidic, an artifactual pigment may form in bloody tissues when exposed to the solution. This pigment is called haematin. It is a dark brown / black coloured artifact that can form when the pH of the solution becomes too acidic. For this reason, formalin solutions are normally kept above a pH of six. This specific pH value is a direct result of a property of the amino acids known as an isoelectric point (p1). It is the pH at which the amino acid has no net electrical charge. Below the p1 value, amino acids in solution tend to be positively charged, and above the p1 value, amino acids tend to be negatively charged). The change in charge is more of a gradual process - not an immediate crossover between positive, neutral and negative. Therefore, as pH values climb, amino acids in solution become increasingly negative (and vice versa). Each amino acid has its own p1 value, but the average value for all amino acids, collectively, is approximately six. Therefore, the minimum pH necessary for the prevention of haematin formation and the pH at which amino acids tend to be neutral are the same. Formalin solutions, usually kept above a pH 6.0, would begin to oxidize the amino groups of the exposed proteins. In other words, the amino groups would lose a hydrogen ion. It is to this oxidized group that formaldehyde molecules tend to bind. Due to the tendency of formalin to oxidize into formic acid when exposed to atmospheric oxygen, most solutions are buffered in some way so that hematin pigment formation is inhibited. A very common buffering agent is phosphate (i.e. sodium phosphate, monobasic and dibasic). While being a very effective buffer, when using phosphate in formalin, one needs to start the dehydration process around a concentration of 70% (or lower, of course) in order to prevent the phosphate from precipitating out of the solution. This precipitate can leave artifactual remains in the tissue itselt and, more commonly, can lead to a blockage in the initial alcohol's line or tubing on the tissue processor. In addition to keeping the first alcohol at 70% or lower to prevent this from occurring, one can also use a formalin solution that is buffered with a non-phosphate buffer. These fixatives produce the same results as their phosphate-buffered counterparts, but do not have the hassle of phosphate precipitate associated with them. Formaldehyde may be the simplest member of the aldehyde classification of organic molecules, but its uses are many-spanning much more than histology labs and far outreaching its aldehyde siblings. It may not be the fastest fixative available, but it is certainly the most compatible with the wide range of procedures being carried out in today's fast-paced histology and research laboratories. Without doubt, its simple molecular structure does not accurately reflect the complexity of its actions or the effectiveness with which those actions are performed. In conclusion, formalin fixation will affect every subsequent step that the tissue has to endure. Formalin preserves tissues by stabilising proteins and preventing both autolysis and putrefaction. It also maintains the relationship between cells and extracellular substances by changing soluble substances within the cell to insoluble substances, thereby protecting the tissue from the denaturing effects of the ravages of subsequent processing. If fixation is inadequate or unsuitable, then the subsequent staining methods will be impaired. Delays in fixation, variations in the duration of fixation or changes in the concentration of the fixative may result in poor overall fixation with tissue loss occurring. Why do we use 10% formalin? 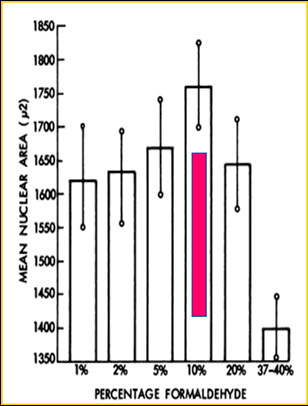 From the following graphs comparing the mean nuclear area and the number of nuclei per field, it can be seen that the optimum concentration for formalin is 10%. The first graph shows that the mean nuclear area diminishes if the formalin concentration is increased or decreased from 10%. The second graph indicates that if the formalin concentration is lower than 10%, the number of nuclei fall, whilst the number of nuclei rises when the concentration of formalin increases above 10%. How do we know when formalin is weak? When formalin is below optimum concentration, inadequate fixation occurs and this can be seen clearly in the images below. The samples on the left in the container and on the dissection bench are clearly unfixed after having the same fixation time as the samples on the right. This can especially occur outside the laboratory when operating theatres have their own supply of concentrated formaldehyde. As a result, the dilution of formalin is not always kept at optimum concentration usually because of poor control in the training of staff in maintaining the correct diluting procedures. What do we see under the microscope? The microscopic images below show the effect that poor and inadequate formalin fixation can have on haematoxylin and eosin stained preparations. 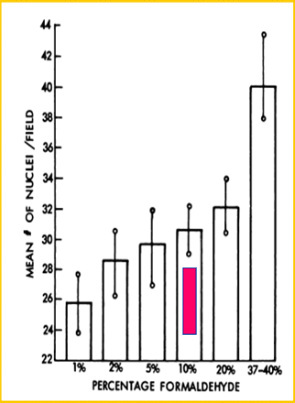 It can be seen clearly that the images support the conclusions of the graphs described above where both area and number of nuclei become dramatically diminished if optimum formalin concentrations are not maintained. Concentrations of formalin can only be maintained accurately if laboratory and theatre staff are competent in correct procedures for diluting and dispensing 10% formalin from 40% formaldehyde concentrate. 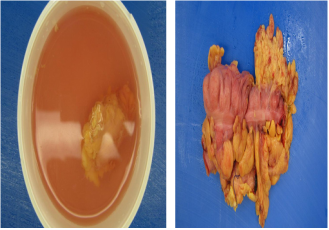 Fixation of surgical specimens is carried out at room temperature, although 0-4 degc will slow down autolysis. However, chemical reactions, including those of fixation, are more rapid at higher temperatures. Formalin heated to 60 degrees Centigrade is sometimes used for the rapid fixation of urgent biopsy samples, but the risk of tissue distortion is increased. The penetration of fixatives into tissue is clearly an important phenomenon. As this process is relatively slow, the tissue samples should either be very small or very thin in order to obtain optimum fixation. The greatest factor influencing the rate of fixation is the thickness of the tissue. Whole organs should therefore be sliced to expose the cut surfaces to the fixative as soon as possible after removal. During fixation, tissues commonly change in volume due primarily to changes in both membrane permeability and ion transport. Some intercellular substances such as collagen swell when they are fixed. Tissue fixed in formaldehyde and embedded in paraffin wax can shrink up to 33%. This appears to be determined by factors of cost, effectiveness and solubility. The staining of tissues has been shown to alter with the concentration of the fixative employed. Formalin is generally used as a 10% solution. The fixation time is dependent on sample size; for small biopsies 2-6 hours may suffice, but larger tissue samples usually require overnight fixation. Whole organs are usually sliced to ensure adequate fixation. If tissues are fixed in 10% formalin for 24 hours, then most of the fixative can be washed out in water. Although formaldehyde reacts rapidly with tissue components, the reaction is largely reversible. Prolonged fixation in formaldehyde is known to cause shrinkage and hardening of tissues. Fixation are able to protect the structure of bone from damage that may be caused by the acids that are employed as decalcifying agents. 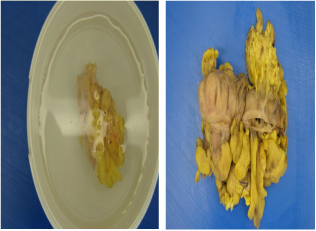 Poorly-fixed specimens can become macerated and stain poorly and extended fixation times for bone should be carried out before commencing decalcification. Bone specimens should be sawn into thin slices using fine tooth saws prior to decalcification. The method is usually carried out between the stages of fixation and processing and is essential for good section preparation and is used for bone and other tissues that may contain calcified areas. Several agents have been used to decalcify tissues, each having advantages & disadvantages. Strong mineral acids such as nitric and hydrochloric acids are used for dense cortical bone and often used in mixtures (Tables 1). However, strong acids act quickly but also damage cellular morphology and bone marrow. Weak organic acids such as acetic and formic are less aggressive and more suited for bone marrow and other softer tissues (Table 2). Ten percent formic acid is the best all-around decalcifier and some solutions combine formic acid with formalin to both fix and decalcify tissues. Otherwise known as ethylenediamine tetracetic acid, it decalcifies by capturing the calcium ions from the surface of the hydroxyapatite crystal thereby slowly reducing its size. The action of EDTA is mild, slow and pH dependent (usually pH7.0) but works more rapidly at pH10. It is used mostly for research in areas such as immunocytochemistry and molecular biology where sonication may be used to speed up the process. Electrolytic decalcification - this method involves placing the bone in an acid decalcifier and attaching it to an electrode through which current is applied. Ion-exchange resins - these may be added to the container holding the decalcifying agent. The resins take up the calcium ions and maintain the effectiveness of the solution. Surface decalcification - this is used to decalcify tissues that have already been embedded. Blocks are trimmed to expose the calcium and placed face down in acid decalcifier for short periods. This allows the decalcifier to penetrate a small distance into the block and dissolve the calcium. 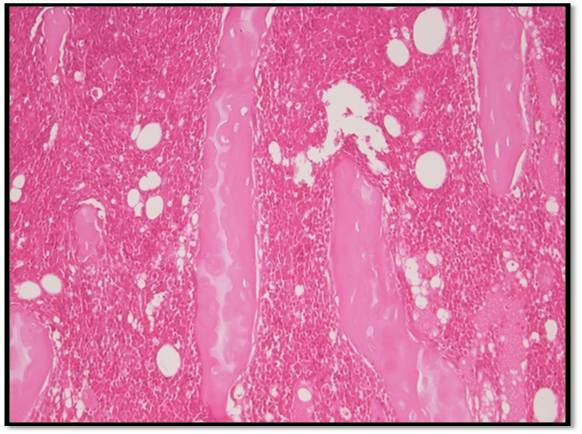 Incomplete decalcification can cause excessive distortion of tissue whilst over-decalcification, particularly with the strong acids, will cause problems with the staining of basophilic elements such as cell nuclei. End point is usually achieved by using X rays, chemical or physical methods. This is the best method for determining end point, particularly for large samples such as femur heads since X-rays will clearly reveal tiny residual calcium deposits and allow further treatment if required. A simple chemical test can be applied when some acid decalcifiers are used (particularly formic acid). Ammonium oxalate solution is added to a sample of the decalcifier that has been neutralized with ammonium hydroxide. If calcium is present a precipitate of calcium oxalate will form indicating that decalcification is probably incomplete and a longer time in decalcifier is required. Physical tests require manipulation, bending, probing or trimming of the specimen. However, mechanical damage can occur during bending or probing and small deposits of calcium can easily be missed. A method of determining the end point by carefully weighing the specimen after rinsing and blotting may also be used. Concentration - this will affect the rate at which calcium is removed. The concentration will be depleted as it combines with calcium so large volumes and regular renewal is recommended. Temperature - increased temperature will speed up decalcification but also increase the rate of tissue damage. Agitation - gentle agitation may help to increase the rate. Fluid access - the decalcifier should have access to all tissue surfaces to enhance penetration and removal of calcium.